Chakalaka Recipe: A Traditional South African Dish. Chakalaka is a traditional South African vegetable side-dish. Colorful and spicy, it often accompanies grilled meat, fish, stews or curries. It usually consists of carrots, peppers, onions, tomatoes and beans. There are many variations pf this dish, depending on region. Chakalaka has been a staple food for South Africans, and is a required condiment at South African barbecues, known as braai. It is served hot or cold with a slice of bread or a bowl of pap (a kind of polenta). 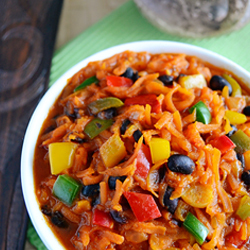 This colorful vegetarian dish is uncomplicated to prepare and full of flavor. Saute onion in olive oil until soft. Add garlic, and the peppers and cook for about 2-3 minutes. Add grated carrots and season to taste. Add chopped tomatoes and tomato paste, and cook until vegetables are soft. If liquid evaporates too quickly, add a little bit of water. In a small bowl, combine cornstarch with ¼ cup water. Add to the mixture and stir until thickened. Remove from heat and add beans and chopped fresh coriander. Serve hot or cold.